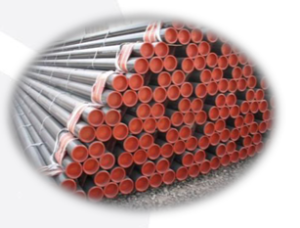 Drill Pipe is a thick-walled, seamless steel pipe with pin and box shouldered tool joints used in rotary drilling to turn the drill bit and to provide a conduit for the drilling mud. The range sizes consist of 2.7/8″ to 6.5/8” OD with API/ Premium tool joint connections in various grades and weights. 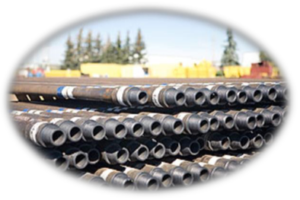 Heavy Weight Drill Pipe (HWDP) offers a gradual transition from heavy, rigid drill collars to the more flexible drill pipe which helps to reduce the number of fatigue failures seen directly above the Bottom Hole Assembly (BHA). The range of heavy weight is in 3.1/2″, 4″, 5″ and 5.1/2″ consisting of hard banded tool joints and raised wear pads on central upsets to optimize wear resistance. Drill Collars is a component of the Bottom Hole Assembly that provides weight on bit for drilling. We can provide drill collars with a range of specifications. Slick or Spiral Type (to reduce differential sticking) with slip recesses. Our range consists of 2.1/2″ OD to 9.5/8″ OD up to 31ft and have API connections machined with Boreback and Stress Relief Grooves as standard. 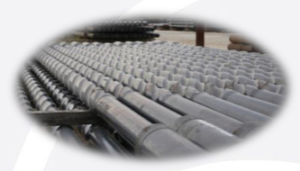 These can be provided in both Alloy Steel and Non Magnetic Stainless Steel. Tubing (Test String) is a Small diameter pipe, with pin and box tool joints that are run in to a completed well. Wells can be tested and produced through a string of tubing. The tubing connections are designed to be used in moderate-to-high pressure oil & gas wells requiring metal seal reliability with good structural capability. Recommended for use in gas wells and higher pressure oil wells. 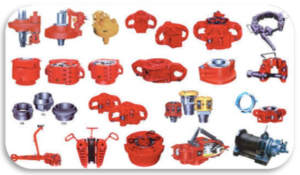 Accessories is a comprehensive range of drilling equipment used in the Bottom Hole Assembly (BHA) of the drill string; including drill bits, hydraulic & mechanical drilling jars, hole openers, mud motors, string & near bit roller reamers, shock tools and various stabilizers. This is also can be referred to the equipment used to handle the Tubular i.e. Elevator, Hand Slips, Safety Clamps, Stabbing Guides, Manual Tong etc. Pressure-Control Equipment is integral to wellsite safety and unconventional drilling techniques to mitigate hazards. Pressure-control equipment includes blowout preventer (BOP) systems and components. This also includes IBOP, Kelly / Safety Valves, Dart Sub etc.